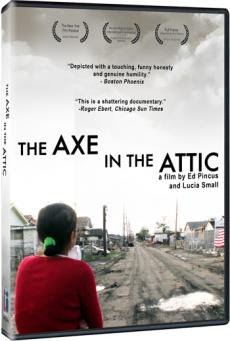 The Axe In The Attic is a powerful film done by two film makers focuses on the aftermath of Hurricane Katrina and it's effects on the people who lived through it. I remember scratching my head during the first days of Katrina wondering why the government wasn't doing more to take care of our people. These are not refugees from other countries, they were United States citizens who were going through a horrific ordeal yet New Orleans looked like a war torn area. The horrific stories shared, reiterated what I was feeling. How could this be allowed to happen? This is an intimate account of what the people were going through told in their own words, plus narrative form. My heart was bleeding for those who survived and those who perished. Stories of a mom who tossed her baby off a bridge after playing with it along with her other children. A man who was shot because he was demanding answers. People who lost everything. The tears! The visits to the homes all gut wrenching but it was a piece of our history where we saw the breakdown of systems that were set in place for catastrophes like this.